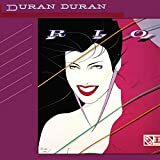 Rio is the second studio album from 80s band Duran Duran. It was originally released in 1982 and received Platinum certification in 1983. The 2CD Deluxe Edition includes both CDs from the 2009 Limited Edition release repackaged in a digipak. It features the original vinyl track list, alternative mixes, demos, and several tracks never released in CD format until 2009. There is no digital download for the 2CD release as the tracks are already available. The single CD version includes the original album and five US mixes included in the 2009 Limited Edition release.